Fall is almost here! Fall weddings offer unique opportunities to get creative. There are so many possibilities including local handcrafted favors, exclusive fall treats, and leaf art. We love the landscape, color, and festive feel fall weddings create. Check out some of our fall wedding favor ideas and add some of your own! Fresh-picked apples are one of fall’s tastiest treats. Make a trip to your local grocery store, or enjoy a day apple picking with your honey at a local farm. Granny Smith, Red Delicious, Macintosh, pick your favorites and mix-and-match. Make candied apples to give out as favors and incorporate some fun toppings. We personally love chocolate chips or nuts for a delicious coating. Your fall wedding guests will eat these treats up! Consider incorporating mini jars of fresh honey into your fall wedding table décor. The rich colors represent everything fall, and it’s a tasty addition to everyone’s pantry. Place them in mismatched dark brown baskets to complement colors. We love these jars we found with personalized labels! Peaches are another great gift from fall. 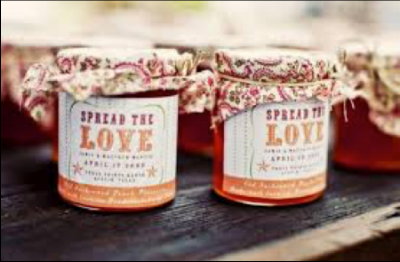 For your fall wedding create mini jars of peach preserves with cloth fall-hued pouches. Make your own labels to create a sentimental thought that guests can leave with. Reds, browns, oranges, are just a few beautiful fall colors to work with. The cloth pouches are a unique touch over a traditional jar lid! We might be biased to this idea for your fall wedding… we love copper! Take on this simple DIY project to create elegant fall-inspired ornaments. Your guests will enjoy a true-to-life piece of fall all year round. The copper coating is chic and perfect for your fall wedding. Take a hike with your sweetheart and collect the perfect leaves for these favors. These are the exclusive fall treats we were talking about earlier. Set up a donut and cider bar at your fall wedding for guests to create gift bags. We may even dare to suggest spiking a batch of apple cider for cocktail hour. If you want to give your guests the full taste of fall this is the ticket. Give your fall wedding a masquerade flare by incorporating feather masks to get ready for Halloween! Hand them out at cocktail hour and give your guests a chance to play dress-up. This simple Halloween-inspired fall wedding favor is just too fun to skip.